Amphibian species are becoming extinct at a pace never seen before. For the first time, scientists have gathered enough evidence to assert that humanity might be facing one of the biggest extinction crises of recent times. Species, genera, and even families are vanishing at alarming rates. In 2004, the Global Amphibian Assessment conducted by the World Conservation Union (IUCN) revealed that one-third to one-half of the world’s 6,000 amphibian species are currently threatened with extinction and over 160 have already disappeared. Many of the most critically endangered species require help to save them in the short term until adequate conservation measures to secure wild populations can be developed. 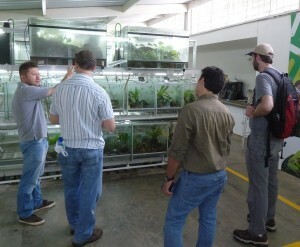 This is where ex situ breeding programs come in to work as important tools for saving species. It is widely believed in the scientific community that many more species may go extinct before we are able to act and the current generation will be held responsible for this loss by future generations, if no immediate action is taken. It is of utmost importance to raise awareness among national governments, world media, school educators, corporations, philanthropists, and the general public about the fragility of amphibians and the enormous responsibility that each of us has for trying to rescue the highest number of species from extinction. Addressing the amphibian extinction crisis represents the greatest species conservation challenge in the history of humanity, and one of the important roles of the AArk is to help raise awareness of the plight of amphibians, and the ways in which people can help to avert the crisis. Electronic newsletter – our quarterly electronic newsletter is distributed to almost 6,000 subscribers throughout the world, and is available in English and Spanish. 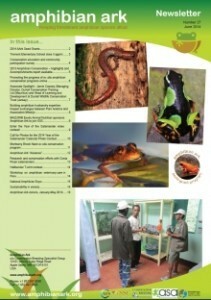 The newsletter contains updates on ex situ conservation projects by our partners, training and conservation assessment workshop reports, funding opportunities, and other relevant amphibian news. Facebook – our Facebook page currently has over 5,000 Likes, and is a great place for our partners, colleagues and friends to share their own stories and news updates. Year of the Frog – in 2008, Amphibian Ark initiated and ran a very successful global campaign, called 2008 Year of the Frog. Many hundreds of zoos, aquariums, museums, universities, schools and other organizations took part in this campaign, and our messages reached millions of people around the world. You can read some of the press articles about the campaign, and see videos with support from some of our Patrons. Individual and collective support for this campaign is helping develop the capacity to coordinate ex situ programs implemented by partner organizations around the world. 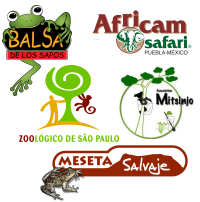 The main goal of this campaign was to generate public awareness and understanding of the amphibian extinction crisis and ensure sustainability of the survival assurance populations by creating funding for this conservation work that continues well beyond 2008. 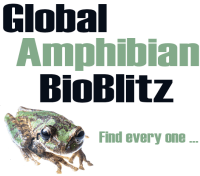 The money raised from this global campaign is also helping to fund global Amphibian Ark coordination activities and regional initiatives such as rescue workshops, cooperatively managed centers and coordination of activities within each region. Conferences and workshops – AArk staff, and staff from our partner organizations make regular presentations at relevant conferences and workshops. Some of the presentations that have been given by AArk staff are available for download. Fortunately, a thriving industry already exists that specializes in captive management of animals, and raising awareness about conservation issues, making it uniquely capable of helping with the delivery of amphibian conservation messages. Zoos and related facilities worldwide include over 1,200 institutions, with 100,000 employees and 600 million visitors per year, equivalent to one in every 10 people in the world. Zoos can assist with initiatives such as rapid response rescues, captive assurance colonies, providing animals for release and research, conservation education, capacity building, fundraising, and help to develop recovery plans. Zoos also play a significant role in education their general visitors via amphibian displays and associated graphics and information boards, and also through their more formal educations programs for school children and adults alike. Hopefully, the attention they generate will translate into resources and good will toward amphibian safekeeping. This is an opportunity for everyone, from zoos and aquariums, to private citizens, to make a vital conservation contribution, and for our community to be broadly acknowledged as a credible conservation partner. Supporting this call to action is clearly within the financial capacity of all zoos and aquariums, and engages the diverse expertise found within all institutions. Addressing the amphibian extinction crisis represents the greatest species conservation challenge in the history of humanity. Without immediate captive management as a stopgap component of an integrated conservation effort, hundreds of species could become extinct. The outcome of Amphibian Ark will be that we will have saved hundreds of species from extinction, developed capacity both within our institutions and globally to continue to provide amphibian species with care and protection when needed, formed a true partnership between ex situ and in situ components of conservation, established a model framework for responding to future species conservation crises, and demonstrated to the world that zoos and aquariums are essential conservation organizations. Continuing to raise awareness of the amphibian conservation crisis, is vital to maintain the support for amphibian programs, and the Amphibian Ark team will continue to inform as many people as possible, so we can all, collectively, help save amphibians.